IBSAT (ICFAI Business School Aptitude Test) is an aptitude test conducted by the ICFAI University Group, for students seeking admission into the management programs. 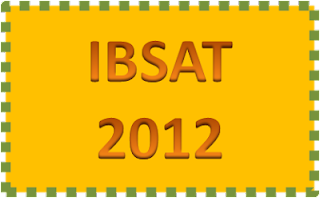 IBSAT consists of multiple choice questions. 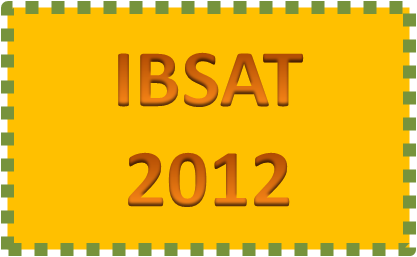 IBSAT is for 2 hours duration and is aimed to test the applicant’s ability in quantitative techniques, data interpretation, data adequacy, vocabulary, analytical reasoning and reading comprehension. ICFAI business school has campuses in various cities like Ahmedabad, Bengaluru, Chandigarh, Gurgaon, Kolkata, Mumbai, Noida & Pune. Eligibility: Graduates (any discipline) in English medium with 50% and above aggregate marks. Final year students awaiting results can also apply. All India Management Aptitude Testing Service (AIMATS), New Delhi conducts Management Aptitude Test (MAT) on national level every year in the month of February, May, September and December. The Government of India has approved MAT as a National Entrance Test for getting admission to various MBA and equivalent programs. All management institutes that participate in MAT are either AICTE (All Indian Council for Technical Education) approved or affiliated to universities. 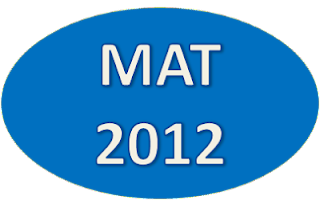 This year the paper based MAT entrance exam for December will be held on 4th December, 2011 and computer based exam will be held on 10th December, 2011. 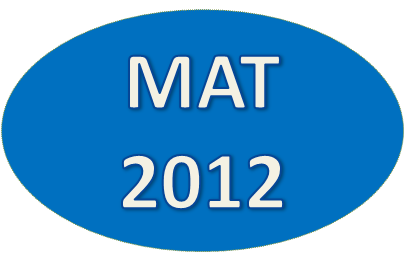 The registration for the exam has already begun and last day for registration is 12th November, 2011. List of Participating Management Institutes: Four Digit codes for Management Institutes/University Departments accepting the MAT Score are given in the List of Participating Institutes/Universities as MI Code. Disclaimer: All data and information provided on this site is for informational purposes only. http://www.careernurturer.com and http://farzadminoodamania.blogspot.com makes no representations as to accuracy, completeness, currentness, suitability, or validity of any information on this site and will not be liable for any errors, omissions, or delays in this information or any losses, injuries, or damages arising from its display or use. Very helpful session on career guidance. Had a personal tough during the counselling. Very informative on future career options in academics and how to set career goals. Thank you very much. Felt great to know more about the field I need to get into. Very impressed by the way he helped in deciding which career to take after 10th. Overall, I would say it was very good. It was an enlightening experience which provided much needed clarity. There was a structured outline given which helped me. Overall it was an extremely helpful and communicative session. We had an amazing experience with Farzad Damania. We came across different fields of education, very informative. Thanks a lot for providing us insight into different fields. Mr. Farzad was very thorough in connecting the dots about my son’s interests and aptitude and explaining the career options available to him to play to his strengths. Thank you! I had a great experience. Now I am clear with what career I have to choose. Thank you so much for guiding me with my career options. Elaborate, thorough, scientific. Very insightful and knowledgeable. It was pleasant and delightful experience. Wishing all the very best to Mr. Farzad for future. Keep up the great work. It turned out to be extremely helpful. It made my career choices really clear and I know what I should do now. The tests helped to get to know myself better and where I stand. It was a nice experience and I would recommend others to reach out to you for help as well. I am extremely happy and now much more aware of the different careers available; and also aware of what kind of careers I would be suitable for. A huge thank you to Farzad Sir for enlightening me and helping me put things in perspective. It was an excellent meeting with Mr. Farzad regarding my daughter's counselling. He seems very sincere in his work, his guidance, analysis and evaluation process are up to the mark. Overall very happy experience and got clarity about my daughter's future. I would definitely like to refer his name to others. Mr. Farzad Damania is to say the least, a true Career Nurturer. Great clarity, excellent research in the field of education. He helped us understand our son, his strengths and weaknesses and most importantly his ability and direction he has to take for a fruitful future. Would recommend Mr. Damania to all my friends. To add to this a thorough gentleman! Very professional. Thank you for truly showing and channelizing my focus in the right direction. The counselling has opened many fields and interests and has given a large scope for career choices. I would recommend every individual to take the aptitude tests for a more secure and brighter future in career. It was a really good experience. I understood a lot about the options available to me after 12th. It was way better than the other career counselling that I had visited earlier. I would like to thank you Sir for explaining to me everything in detail. It was an wonderful experience. We are satisfied with your counselling and you have given right direction for the future of my son. Time very well spent. Excellent analysis and timely guidance to my daughter. Mr. Damania, thank you very much.